Innovative Safety Systems Ltd (ISS) has again been proven the leading authority in vehicle safety technology as live digital camera technology has finally been rejected as unworkable by other providers. Instead the market place is following in ISS footsteps and offering customers a system that provides daily operational reports without the vehicle operator having to set foot outside of the cab. ISS chose not to invest in live recording technology on the grounds that cellular networks have not built a reliable enough infrastructure to support the technology with consistency. The result was all too often a ‘No Connection Available’ screen. Bearing in mind the huge investment on data over the lifetime of a fleet ISS deemed the technology commercially unacceptable. Instead the company invested in LANlink, a system that enables operators to have recorded footage downloaded immediately by wifi as vehicles return to depots. The system also sends an automatic daily health report for each camera and recording device alerting the operator of any faults immediately. ISS also offers a proactive maintenance service that links them via the internet directly to the vehicle health reports, enabling them to fix any problems with no prompting required by the customer. Thereby enabling customers to monitor the performance of their fleet closely in the safe knowledge that ISS will keep the equipment running smoothly. In the same way if there is a particular road or area that needs to be monitored closely it can be ‘geo-fenced’ by the software. Recorded coverage for that area will be downloaded automatically from each vehicle as it return to the depot. 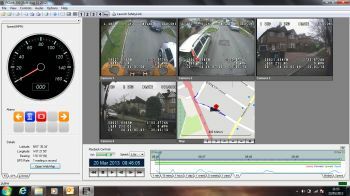 The recorded footage comprises 5 tiles of information, one each for each of the four cameras and one for the map to show the exact location of the vehicle corresponding to the footage. There is also a dashboard displaying vehicle operational details such as speed, braking etc. To set up the system, a vehicle mounted aerial and mobile router is installed on each vehicle, along with an aerial at the yard or depot, which can be fixed to any designated computer or laptop. The company has seen impressive growth over the past 12 months with a flock of new customers migrating over from previous suppliers due to poorly performing products and lack of service. ISS has reinvested in the business and recently relocated to larger, fit for purpose premises, featuring a state of the art showroom to demonstrate its market leading technology, and providing excellent meeting facilities for its customers.